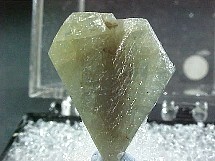 Scapolite: Aracruz Espirito Santo, Brazil. 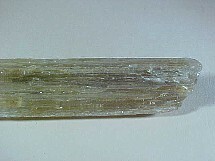 A pale yellow scapolite. This has deep striations and the termination is etched. I have been told that under the rough exterior they have been getting faceting quality material from these crystals. 1-3/8" (2-1/2cm) tall. 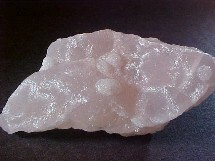 Lustrous pink smithsonite from the El Refugio Mine. A pretty miniature. 2-1/4" across. 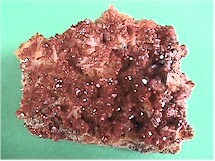 Brilliant brownish/orange vanadinite crystals on blades of white barite. Not as red as the photo indicates, A great small cabinet size piece, 8-3/4cm across. 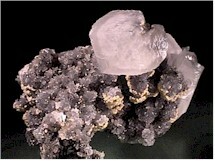 Calcite on quartz with siderite and boulangerite. From the Herja Mine. A very attractive miniature. 4-1/4cm (1-3/4") across. 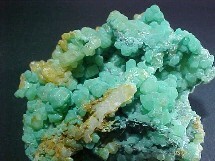 Clusters galore of deep minty green cerussite with minor matrix. A real colorful miniature. 2" x 2"
A twinned thumbnail from Rio Das Pratinhas. About 3/4" tall and 1/2" across the top.